In a move that allows the show’s producers to catch up with the rest of us, a top-level executive at Sesame Street has declared that beloved characters Bert & Ernie are gay…if viewers want them to be. The move marks an evolution on the part of Sesame Workshop, which had previously denied that Bert & Ernie have sexuality since they are puppets. Speculation over their relationship has long dogged the characters. Last year, the conversation came to a head after longtime Sesame Street writer Mark Saltzman told Queerty that he always wrote them as a loving gay couple based on his own relationship. Muppet performer Frank Oz, originator of Bert, after an initial denial, even came to endorsing the relationship. Let me tell you that quite a few wrap parties included performances referring to and even celebrating the two characters (among other ones!) as being gay. And even though footage of their frivolous romps will probably never see the light of day, it’s quite an open secret among not just the cast and crew, but Henson fans the world over. Sadly (maybe), most of it was played for laughs, of course! What he actually said and what you claim he said in your headline are contradictory. He did not say they are gay anymore than he said they are not gay. 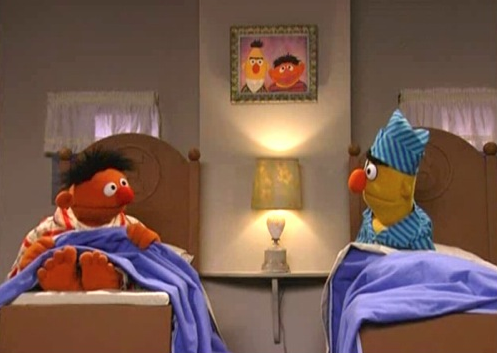 They are fictitious characters and are as “gay” as Skipper and Gilligan, two adult men who “lived” together and like Ernie and Bert, sleep in separate beds. People are reading too much into this. Why the hell is this still news, is Queerty run by a bunch of 8yr olds? THEY’RE GODDAMN PUPPETS!!!!!! GET OVER IT AND WRITE ABOUT SOMETHING THAT AFFECTS THE REAL WORLD……gods you people are stupid. This is old news. Still, what’s the point? Do we really need to have a revelation of this sort 50 years after they first appeared on Sesame Street?